Noah was named to the 2017 Associated Press All-State First Team as a receiver. He was also named as a receiver to the Detroit Free Press First Team, Detroit News First Team, Michigan High School Football Coaches Association First Team, Lansing State Journal Dream Team and Capital Area Activities Red Division First Team. His speed, perfect routs, outstanding leaping ability and sure hands helped lead the Panthers offense into the regional finals. Often teams double teamed Noah yet he still make great catches. 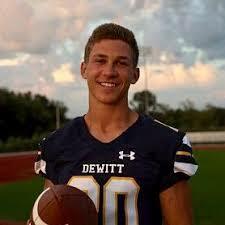 Alongside of co-receiver Alan Smith that helped lead DeWitt to a very balanced offense (2,425 yards rushing, 2,214 passing), Noah led the Panthers with 48 receptions and 1,098 yards (22.9 yards per catch) and 15 touchdowns. For his career, Noah had 59 receptions for 1,467 and 20 touchdowns. An outstanding three sport star, he helped lead the Panther basketball team to an outstanding season and was lead off hitter on the baseball team. Noah went on to play at Northwood University.